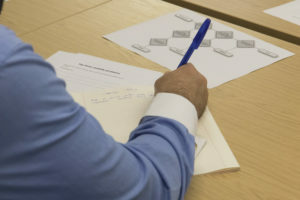 The User Experience Service is supporting the Learn Foundations project to undertake user research and usability testing. In collaboration with the Vet School, we have undertaken usability testing that will help the School enhance their students’ Learn course experience. Join us for this hands-on, collaborative session and find out how easy it can be to improve the usability of your Learn courses. This is the first of a number of sessions we will run this academic year, collaborating with schools to help them improve their Learn course environments. The insight we are gathering will feed into the wider Learn Foundations project. Your participation in this event will help us understand more about how the experiences of both students and staff using Learn can be improved. Directly observing users is one of the most valuable activities you can do to help you meet the needs of your users. Watch real students undertake top tasks in one of the best rated Learn course environments in the University. Participate in the prioritisation of issues the students encounter. Take away easy-to-repeat usability testing techniques you can use to improve your Learn courses. Find out more about how the Learn Foundations project is developing new tools and services to help you enhance student experiences. The User Experience service has used this technique across a wide variety of projects for several years. A low cost approach to collecting qualitative feedback with a list of actions at the end. What is not to love? Should be used as standard for anyone serious about giving their users what they need.